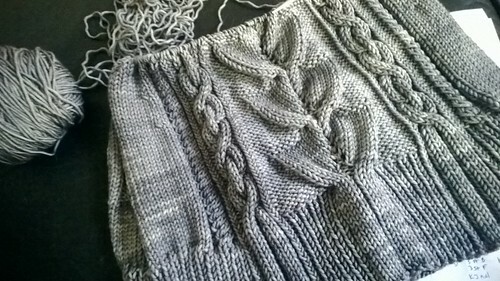 Hey, I finished a sweater [ravelry]. Knit in Madelinetosh Tosh Vintage in Tern, approximately 7 skeins. US8 needles. Modifications: Most obvious change- lowered the neckline significantly. I also cast on the large size at the hip but decreased to the smallest size at the shoulders. The shoulders could be even smaller still! Photo taken by DH at Guemes Island Resort. We didn’t see any whales. Maybe they were scared off by my harpoons under the arms. I finished the body of Ambergris and tried it on. Even with my modifications, it is too large above the bust. It fits fine at the bust and below. I need to rip back, probably all the way to the bottom of the armpit. There will be a lot more math. But I wasn’t feeling up to that. I am a bit discouraged. Instead I started the sleeves. 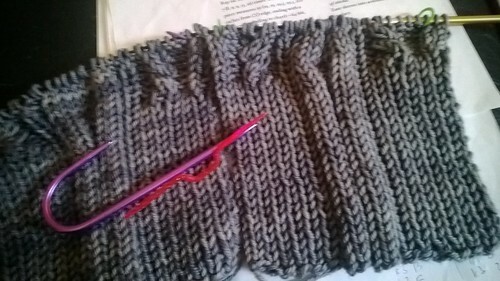 In another pattern deviation, I’m knitting them flat and both at once. Can we avoid sleeve island? 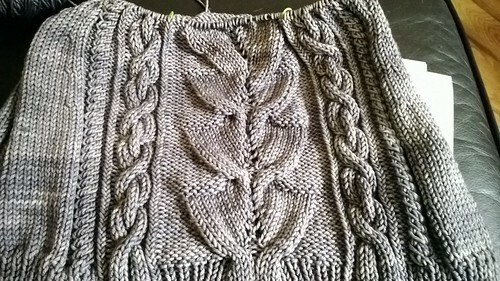 I started a sweater, Ann Weaver’s Ambergris from White Whale Vol II. Then I made a mistake I didn’t catch until a few inches (4) later. It bugged me. So I ripped it back. Now we reknit. This time hopefully without mistakes. I fought it for a while but I finally started a Color Affection (ravelry). It’s mindless but I fear the long, long rows of the edging. I love the yarn, Plucky Knitter Plucky Feet. I actually purchased a kit of these three colors. I wasn’t too sure about them. I thought about it. My Klaralund was in similar colors, wasn’t it? I looked at the nail polish I had just purchased that weekend. OK. Maybe I do like these colors together after all. 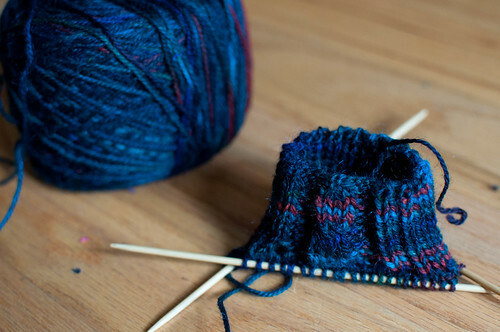 * plucky knitter plucky feet in flannel (grey with blue tone), faded grandeur (olive), technicolor teal. 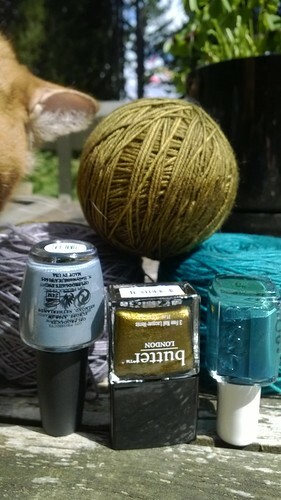 nail polish – OPI I have a herring problem (blue with grey), butter LONDON wallis (olive), essie go overboard (teal). One of the two seminars I took at the ANWG Conference was on the topic of kumihimo. The seminar was originally to be taught by Makiko Tada, but unfortunately she had an emergency come up and was not able to teach at the conference. The capable Shirley Berlin stepped in and took over our seminar. 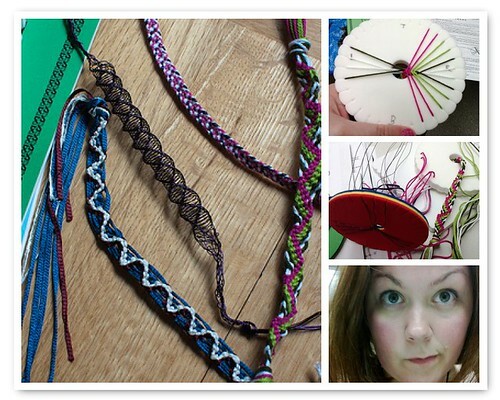 This seminar topic was originally intended to be flat kumihimo braids but with Shirley Berlin stepping in, she adjusted the topics a bit and covered a little bit of everything. I think she may have been expecting more of us to have experience — only a handful of us had done any kumihimo style braiding before. We started out with the most basic flat braid, the first flat braid I learned a few months ago. I picked some colors and textures outside of my usual comfort zone – a pink yarn wrapped with lurex, a purple ribbon, and a plain ol’ white cotton. I quickly got bored with it and slightly frustrated that the different yarn textures didn’t show up differently in the braid. I set it aside and flipped through the (lovely!) pattern books with which Shirley Berlin supplied us (a blue booklet and a green booklet, I think they can be ordered here). I started a zig-zag flat braid (Freda’s Fishbone Braid) in two shades of green, pink, and white while the class started a round braid over a core (Laramie braid). After I had made enough progress with my fishbone braid to conclude that it is awesome, I noticed the class was now working the Laramie braid in wire, using a pen as the core (just to create the space in between). Now that: up my alley. I picked out some dark purple 26ga wire and started that, but quickly became frustrated with the wire tangling. At this point Shirley popped by to see how I was doing and really liked my zig-zag/fishbone braid. She suggested I try another zig zag braid, Mountain Road Lace. 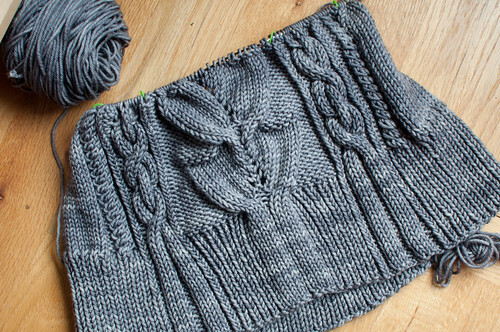 I picked out more yarn — maroon, white, and teal ribbon yarn — and started this pattern. I ended up ripping it out and starting it anew later with more success. Shirley covered a topic I ran up against when I made a kumihimo keychain — how to finish off the ends. 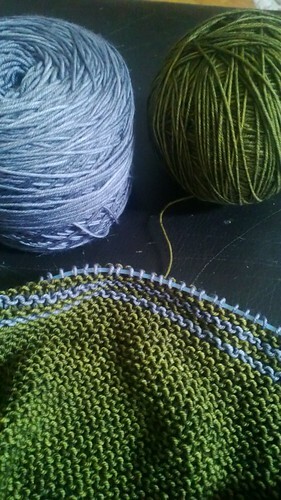 I generally start with a tidy loop of the yarn used, which works fine (given an even number of ends per color anyway). I wanted a tidy way to finish off that was not fringe. One option she explained was to gorilla glue the end of the braid into a finding (this makes me cringe, I do not like glue, but apparently it is a perfectly valid option, so maybe I need to get over it). 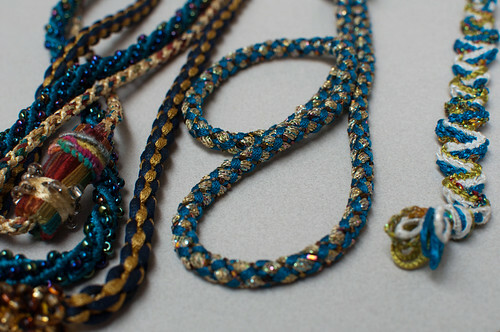 Another option for something like a necklace is to take both ends of the item and wrap it with thread, then sew it together. On top of the stitching, add one bead, make a stitch. 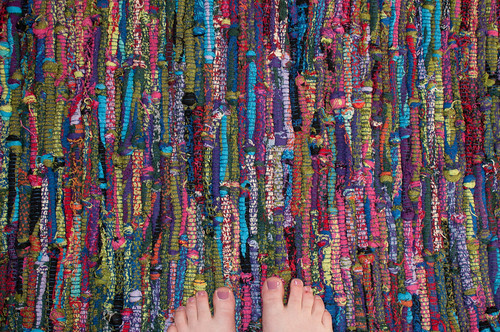 Add another bead, stitch. Continue this method until the entire piece is very secure and has a fashionable connector. 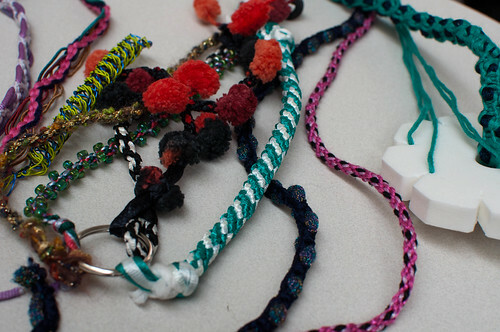 That doesn’t help much with keychains, but it really looked nice on longer necklaces. Overall, this was a good hands-on class and I had a lot of fun. Shirley Berlin is a good instructor and seems to really love teaching these methods. Every year I try to take a class or attend a conference on a fiber arts topic. 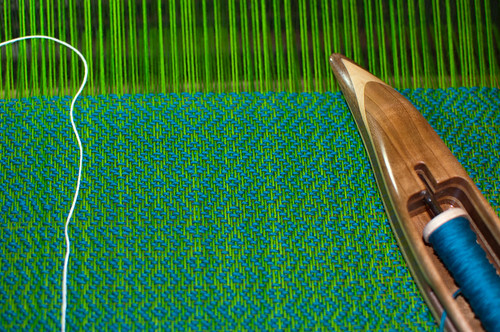 This year I chose to attend the 2013 Northwest Weavers Conference, sponsored by Association of Northwest Weavers’ Guilds (ANWG). 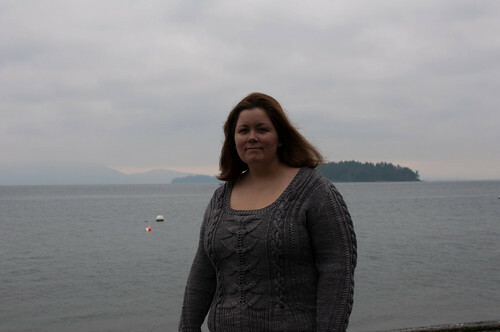 I couldn’t budget (time off + money) for more than two half-day seminars, so I drove up to Bellingham very early Friday morning and planned to drive home Friday evening. The sad thing about only taking two half-day seminars is that you are a second-class student. No conference bag, no woven nametag, no schwag. Not even a pen! Before I checked in at registration, I saw everyone with bags (including one very friendly woman who directed me to the registration building, thank you! you were so friendly and helpful) and I was looking forward to getting one. I was disappointed when I didn’t get one, just a folder and a plain old nametag on some yarn that gave me a rash (thankfully I had benadryl with me). That’s a very minor point and I definitely paid less to attend the conference than people who took 3-day workshops, so it’s not unexpected. I was just disappointed. At least give me a cool zippered woven nametag! 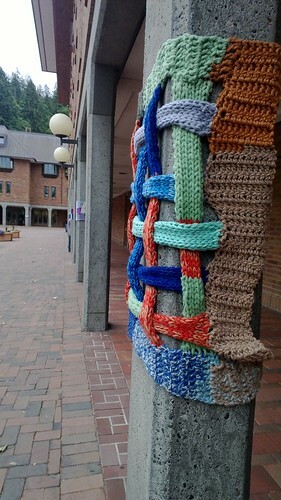 The WWU campus was yarn-bombed by the Seattle Weavers’ Guild Yarn Stormers. It was cute and fun and fit with the campus. After checking in Friday morning and before my first seminar, I hit the marketplace. I’ve been attending fiber arts shows with marketplaces for long enough now that I have a routine. In advance, I write a list of items I am looking for. I bring cash in the budget I have set rather than using a credit card. I try to hit the market before it gets super busy. I generally do a couple of passes before I buy anything. I try not to get overwhelmed (easily happens at big festivals like MD or Rhinebeck, less likely at smaller markets like ANWG Conference & Madrona). 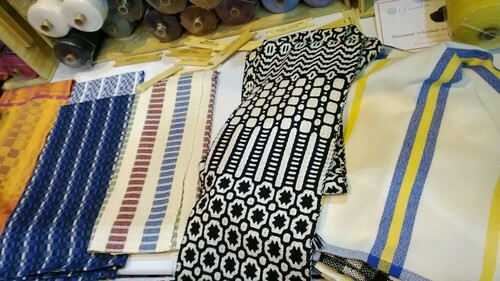 At the Lunatic Fringe Yarns booth, I decided against buying a color gamp kit though it was on my list. I know I can always order one online. 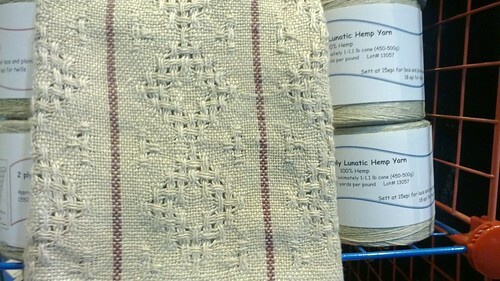 I did almost buy some hemp yarn to make the towels below though. I love them. Also on my list, the Glimåkra booth. I had sent them an email to see if I could pick up a few items to expand my Ideal to a 6S/8T. I visited their booth and they had some lovely samples as well. 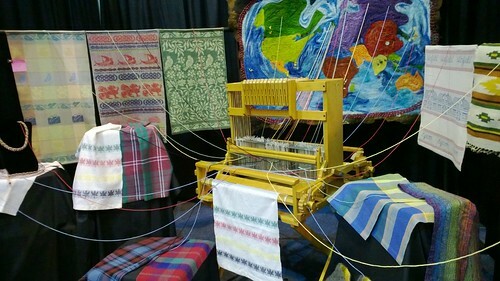 They also had a number of looms set up for testing out (Ideal, Julia, Susanna, Emilia). Joanne and Ed are as lovely in person as they are over email and the phone. I also bought a couple of shuttles at the Bluster Bay Woodworks booth, including my first end feed shuttle and a double bobbin shuttle. 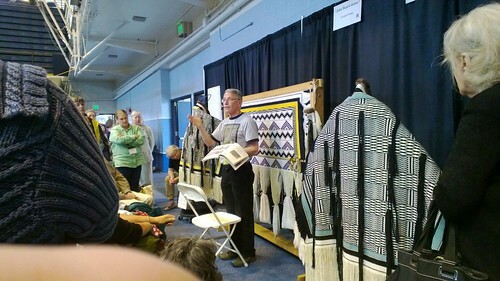 After my second seminar Friday afternoon, John Beard gave a presentation on Ravenstail weaving. It was fascinating. Overall I had a good time, but I was exhausted from the minimal sleep and early morning drive, so I didn’t stick around as long as I’d liked. My seminars and instructors were good but I’ll talk about them separately. 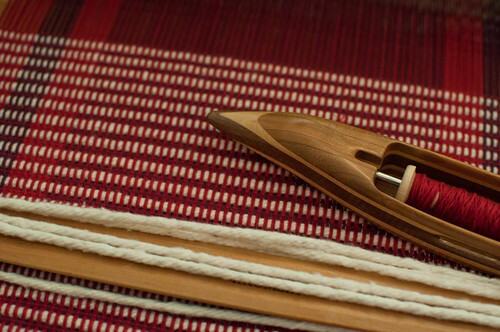 A year ago I bought my first* loom, a new Glimåkra Emilia 50cm rigid heddle. This past weekend I bought my fourth loom – my first floor loom – a 1970s Glimåkra 100cm Ideal (4S/6T). 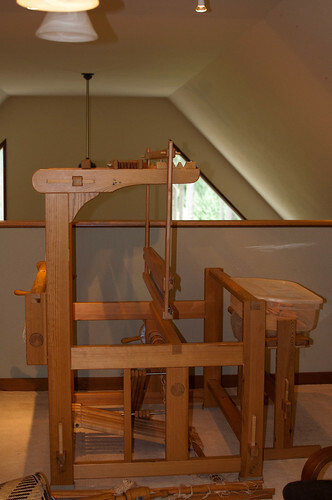 I’m waiting on a shipment from the lovely and responsive people at Glimåkra USA with new heddles, tie-up, and some lamm rods before I can start using the loom. I’ve designed a three stage plan for upgrading the loom to 8S/8T over time. 4S/6T to 6S/6T to 8S/8T. I decided that I can live with four shafts while I learn countermarch. While I wait for the necessary parts, I have placemats to finish up on my table loom. This fabric I’m creating is awesome. I can’t wait to see how they wash up. *OK, technically I had a potholder loom as a kid and I also have a few weavette looms I got in 2008. Yesterday was my sister K’s birthday. 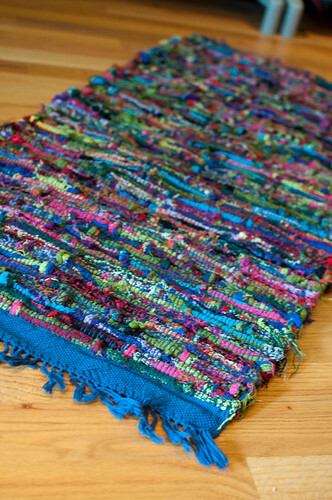 I made her a looper rug with loopers from Crazy as a Loom. 8/4 rug warp in smoky blue, ~200 ends, 8 epi (12 dent reed, threaded 1-1-0). I tried a rag shuttle, ski shuttle, and a long stick shuttle. I found the stick shuttle to work best for the looper chains. 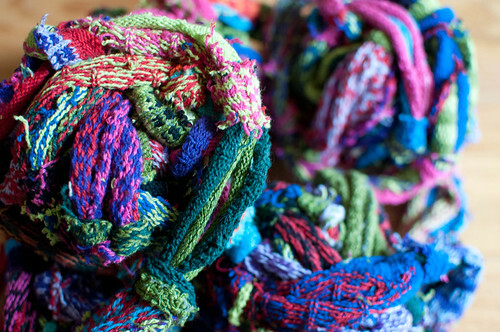 I knotted short sections of loopers, then wound into balls. As I finished a ball, I would knot the new ball to the one I just finished weaving, so there were no looper ends to weave in. I doubled the warp yarn and wove about 2″ on either side of the rug to start. I decided I like the look of that plus fringe on these. Weaving wise, I stood up to weave this. I beat on an open shed, closed shed, and next shed, usually beating each more than once. It was a workout! I used a ~45 degree angle from selvedge which helped keep things somewhat neat at the selvedges (as neat as can be with loopers). I had some issues with my table loom — it’s really not strong enough for this and beating would move all the shafts. It worked out ok in the end though I also could not keep tension as tight as I’d like. It’s been a while since I’ve knit a sock. The inexplicable urge hit me a week or so ago and I dug through the sock yarn before pulling out this very well aged hank of Mountain Colors Bearfoot (Glacier Teal). The yarn doesn’t knit up quite like I expected but I think I like it anyway. My new office gets a lot more natural light than the old one! The current weaving in progress. My first time using a boat shuttle. It’s very quick. Yarn is Wollmeise. 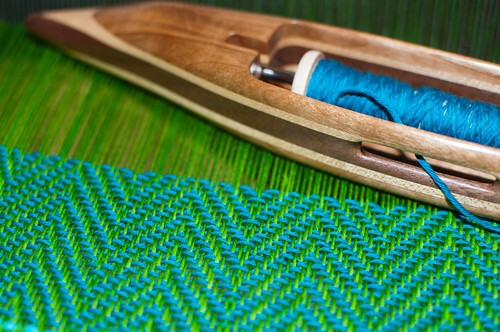 Wollmeise is pretty good for weaving because it almost behaves like a cotton – it’s not stretchy. I finished one table runner at about 2’10″. The second one I hope I can eke greater than 2 feet out of as well. I’m not beating completely evenly, which is most obvious after I take a photo. Still awesome!